Filippo Sanfilippo, Lars Ivar Hatledal, Houxiang Zhang, Massimiliano Fago and Kristin Ytterstad Pettersen. Controlling Kuka Industrial Robots: Flexible Communication Interface JOpenShowVar. IEEE Robotics & Automation Magazine 22(4):96-109, December 2015. Filippo Sanfilippo, Lars Ivar Hatledal, Houxiang Zhang, Massimiliano Fago and Kristin Ytterstad Pettersen. JOpenShowVar: an Open-Source Cross-Platform Communication Interface to Kuka Robots. (Best Student Paper) in Proceeding of the IEEE International Conference on Information and Automation (ICIA), Hailar, China. 2014, 1154–1159. JOpenShowVar is a Java open-source cross-platform communication interface to Kuka robots that allows for reading and writing variables and data structures of the controlled manipulators. This interface, which is compatible with all Kuka robots that use KR C4 and previous versions, runs as a client on a remote computer connected with the Kuka controller via TCP/IP. JOpenShowVar opens up to a variety of possible applications making it possible to use different input devices and to develop alternative control methods. JOpenShowVar is an open-source project and it is available on the Internet under a Berkeley Software Distribution (BSD) license at https://github.com/aauc-mechlab/jopenshowvar, along with several detailed class diagrams, all the mechanics, hardware schematics and demo videos. To show the potential of the proposed interface, two case studies are presented in the video above. 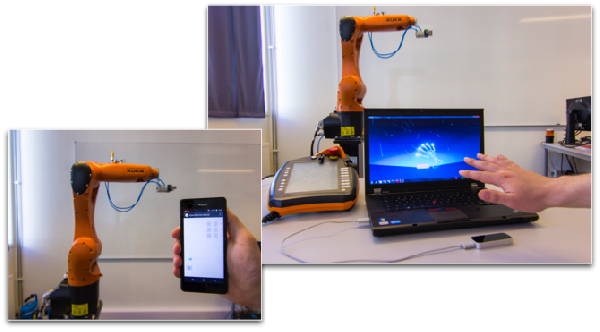 In the first one, JOpenShowVar is used to control a Kuka KR 6 R900 SIXX (KR AGILUS) robot with an Android mobile device. In the second case, the same manipulator is controlled with a Leap Motion Controller that supports hand and finger motions as input without requiring contact or touching. Related simulations are carried out to validate efficiency and flexibility of the proposed communication interface. I gratefully acknowledge the contribution of Massimiliano Fago, an Italian colleague from the IMTS S.r.L. Company, Taranto, Italy and of Lars Ivar Hatledal, a colleague from the Mechatronics Lab at Aalesund University College, Norway. Interfacing an EEG Headset with a 3D Simulation Environment for Rehabilitation in Partially Paraplegic,Stroke Victims. Student: Tom Verplaetse; BSc in Automation Engineering, Department of Engineering and Natural Sciences, AAUC. Advisors: Robin Trulssen Bye, Filippo Sanfilippo. On the Usage of Single-Electrode EEG Devices for Biometric-Based Person Identification. Students: Guilherme Felipe Bosger, Rodrigo Bessa Juliao, Hugo de Almeida Ribeiro; BSc in Automation Engineering, Department of Engineering and Natural Sciences, AAUC. Advisors: Filippo Sanfilippo, Siebe van Albada. Active Heave Compensating Crane for Loading/Unloading of Platform Supply Vessels (PSV). Students: Ivan Flatval, Ørjan Gjelseth; BSc in Automation Engineering, Department of Engineering and Natural Sciences, AAUC. Advisors: Siebe van Albada, Filippo Sanfilippo. Among all the supervised student projects, a selection of them is listed in the following. Grasping and Locomotion for Modular Snake-Like Robots in a Search and Rescue Operations Scenario. Student: Per Myren. Student Summer Job within the BSc in Automation Engineering, Department of Engineering and Natural Sciences, AAUC. Advisors: Filippo Sanfilippo and Houxiang Zhang. Wearable Tactile Feedback Integration for Offshore Operations. Students: Bjørn Tomren, Kai Henning Humberset and Rolf-Magnus Hjørungdal; within the course of Mechatronics, robots and deck machines, BSc in Automation Engineering, Department of Engineering and Natural Sciences, AAUC. A Wave Simulator Framework for Offshore Crane Operations. Humlen; within the course of Real-time computer programming, BSc in Automation Engineering, Department of Engineering and Natural Sciences, AAUC. Advisors: Filippo Sanfilippo, Girts Strazdins, Ivar Blindheim and Webjørn Rekdalsbakken. Within the following project: project description. A Camera Guided Laser Shooter for Tracking Moving Objects. Students: Birger Skogeng Pedersen and Webjørn Yksnøy Bergmann; within the course of Real-time computer programming, BSc in Automation Engineering, Department of Engineering and Natural Sciences, AAUC. Advanced Control Methods for a Search & Rescue Drone. Students: Rolf Ottar Rovde, Kristian Østgaard and Kim Gjøran Robertsen; within the course of Real-time computer programming, BSc in Automation Engineering, Department of Engineering and Natural Sciences, AAUC. An Automated Monitoring System for Detecting Suspicious Subjects in Crowded Areas. Students: Benjamin Selvåg Skinnes, Øyvind Valderhaug Strømsheim and Steffen Sunde; within the course of Real-time computer programming, BSc in Automation Engineering, Department of Engineering and Natural Sciences, AAUC. Development of an Integrated Virtual-Prototyping Framework for Designing Modular Robotic Hands. BSc in Automation Engineering, Department of Engineering and Natural Sciences, AAUC. Haptic Feedback Integration for Maritime Crane Control. Student: Lars Ivar Hatledal; Student Summer Job within the BSc in Automation Engineering, Department of Engineering and Natural Sciences, AAUC. A Modular Grasping Snake Robot. in Automation Engineering, Department of Engineering and Natural Sciences, AAUC. The Demonstrator and Imitator Robots. Engineering and Natural Sciences, AAUC. A Modular H-Shaped 4-Legged Robot. A Modular Robotic Hand with Vision Object Recognition capabilities. Students: Kim Andrè Sund, Kjetil Thorsen, Svein Rune Stangeland, Brita Erica Godfrey; within the course ofMechatronics, robots and deck machines, BSc in Automation Engineering, Department of Engineering andNatural Sciences, AAUC. The work concerning maritime cranes and robot was partly supported by the Research Council of Norway through the Centres of Excellence funding scheme, project number 223254 and the Innovation Programme for Maritime Activities and Offshore Operations, project number 217768. In this context, a close cooperation is established with different partners including Rolls-Royce Marine AS, Norway, Huse Engineering, and the Offshore Simulation Centre AS. Support was also received from the Centre for Autonomous Marine Operations and Systems (AMOS), Research Council of Norway, Centres of Excellence funding scheme, project number 223254. Regarding robotic hands, the work was partially supported by the European Commission with the Collaborative Project no. 248587, “THE Hand Embodied”, within the FP7-ICT- 2009-4-2-1 program “Cognitive Systems and Robotics” and the Collaborative EU-Project “Hands.dvi” in the context of ECHORD (European Clearing House for Open Robotics Development). In this context, a close cooperation was established with the Department of Advanced Robotics at the Istituto Italiano di Tecnologia, Italy, and the Department of Information Engineering at the University of Siena, Italy.